Each ticket gets you entrance to the concerts as well as your first pint of beer(on us)! The namesake of the Road Jam Festival, Two Roads Road Jam Raspberry Wheat with Lemongrass will be pouring in addition to other select Two Roads’ beers. 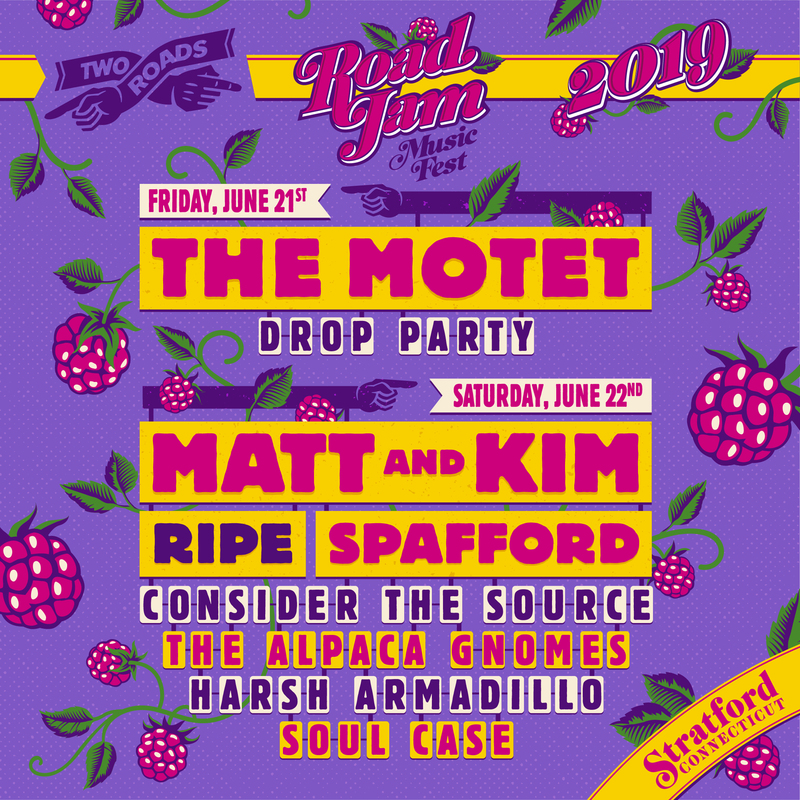 Road Jam Music Fest is a must-attend festival for music lovers and will be the biggest Road Jam to date with two days, two stages and nine bands including Matt and Kim, our nationally acclaimed headliner. CHECK IN: Please check in at main entrance! BRING VAILD ID and your printed ticket to verify. No one will be allowed in without a valid ID. Save Paper! We can scan the ticket via your mobile device. There is NO RE-ENTRY to this festival- once you leave the festival grounds you will not be able to get back into the event! *This festival is OUTDOORS - please dress accordingly! NO RE-ENTRY! PARKING: ONLY limited handicap parking will be available at the brewery. Additional parking at the Honeywell Lot (next to Deluca Field) (1000 Main Street) AND the Shakespeare Theatre Lot (1850 Elm Street). There will be FREE shuttle service both days of the festival from these lots back and forth to the brewery. Beer Tap list to come! And nothing goes better with music and Two Roads beer than our Cluster Truck™ food hub! Great local eats will be sold by some of the area's top food trucks. Food Truck list to come! Check out our vendors joining us for Road Jam Music Festival! (vendors will be on site Saturday June 22nd only)! Vendor list to come! For any questions please reach out to [email protected].